The Kymulga Grist Mill was built around 1860. Timber for its construction came from the nearby forest, and machinery to operate it was made in a foundry in North Carolina. 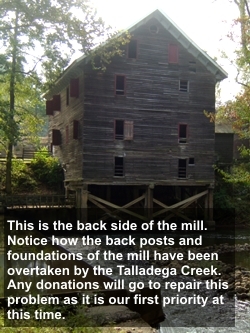 Powered by water turbines, the mill was capable of grinding both wheat and corn. The covered bridge, located a few hundred feet upstream from the mill, was built the same year, in 1860. It provided access to the Georgia Road, a Native American trade route used by frontiersmen and settlers coming into the area. The park is primarily a wooded area, with walking trails and campsites near the creek. Over twenty-five varieties of hardwood trees and approximately fifteen ground plants located along the trails have been identified and marked by professional foresters. Included among the trees are the largest sugarberry tree in Alabama and the largest cluster of white oak trees east of the Mississippi River. Another unique feature of the park is the large stand of Paw Paw trees. Native Americans used the fuit of the Paw Paw tree for food and medicine. The park is a protected area, with an abundance of food, water, and natural cover for wildlife. Among the animals found there are deer, squirrels, raccoons, and opposums. Turkey, quail, ducks, and a variety of songbirds are evident. The creek contains several types of fish and helps provide a habitat for frogs and turtles. The area affords many educational opportunities. Guided tours of the mill allow visitors to observe its structure and machinery and the grinding of corn. Physics and engineering students might profit from a study of the utilization of water and electrical power in the operation of the mill. Studies of the structure of the mill and bridge would also be beneficial to persons in the building and preservation trades. Carpentry classes from Central Alabama Community College have already taken advantage of this opportunity. The unique ecology of the park makes it ideal for nature study. A stroll along the trails allows observation of plants and animals in their natural habitats. The creek and its shoreline provide for the study of aquatic life. Biology and environmental science students could learn much by working here. The land adjacent to the mill was once populated by Native Americans and later by farmers and craftsmen who settled there. Over the years, farms and communities developed. In 1941, this land was acquired by the United States government for the Alabama Ordinance Works, and all families living there were relocated. The tract, of which Kymulga Park is now a part, has remained largely undisturbed for more than 60 years; therefore, on a hike into the woods beyond the bridge, one may find artifacts, evidence of old home sites, or traces of the path of the Georgia Road. Artists and photographers will find a wealth of subject matter in the area, as well as a quiet atmosphere in which to work. Photography classes from the University of Alabama in Birmingham have already worked here as has the Alabama Public Television Network. The part of the park near the bridge offers a venue for musical unstruction and performances. Festivals, featuring folk music and dance, pioneer arts and crafts, storytelling and reenactments of local historical events could be held. In addition to the historical and educational opportunities, the area provides a place for recreation. Camping, hiking, canoeing, picnicking, bank fishing and birdwatching can be enjoyed. Space is available for meetings, reunions, and other events.